This is an interesting shot of a couple of Stripers. This was taken early in the morning before the schools developed. 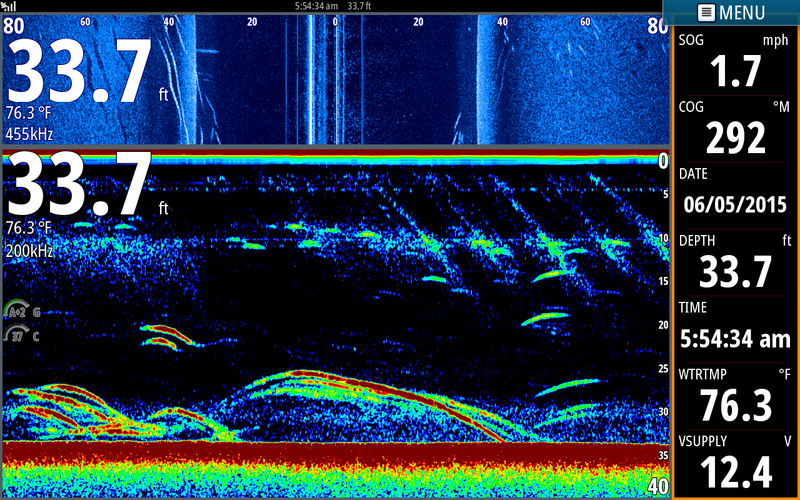 The 2 fish in the middle of the sonar screen were nice Stripers. Notice the white vertical dashes on the side scan. They are not only long but are showing some nice shadows behind them. This is a Striper who did not like being caught. After taking him off the hook he swam as fast as he could right to the bottom of the lake then cruised off happy to be back in his element. 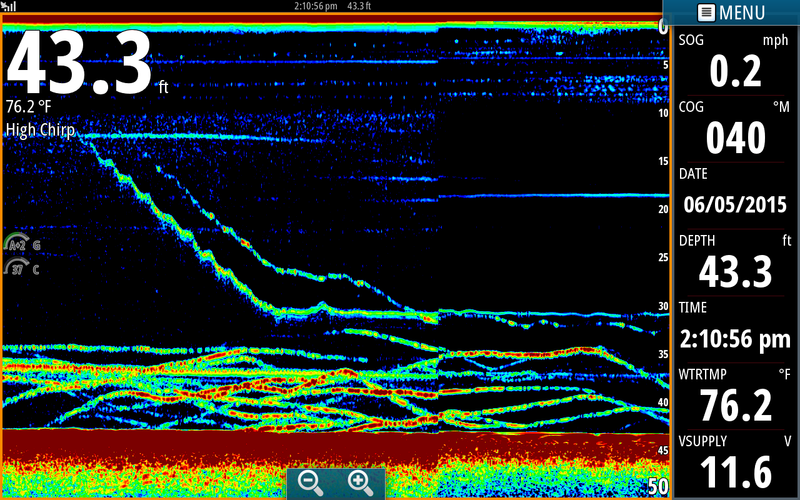 In this pic I am using Chirp to watch my baits coming through some Stripers near the bottom. 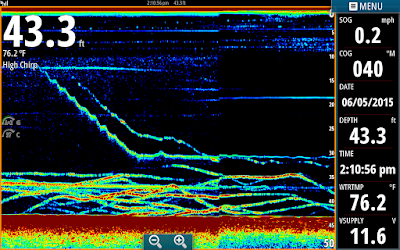 The long horizontal lines near the bottom are 4 of our baits. 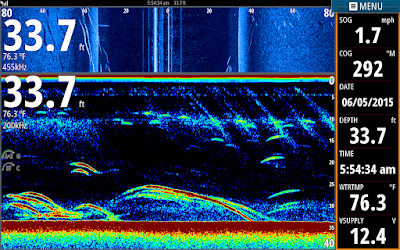 The squiggly two lines are our sinker and bait being set out. 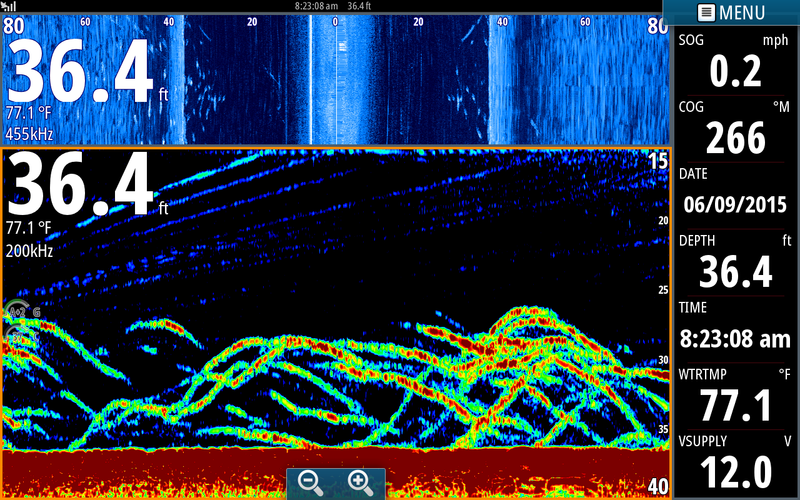 When fish are hugging the bottom Chirp works great. 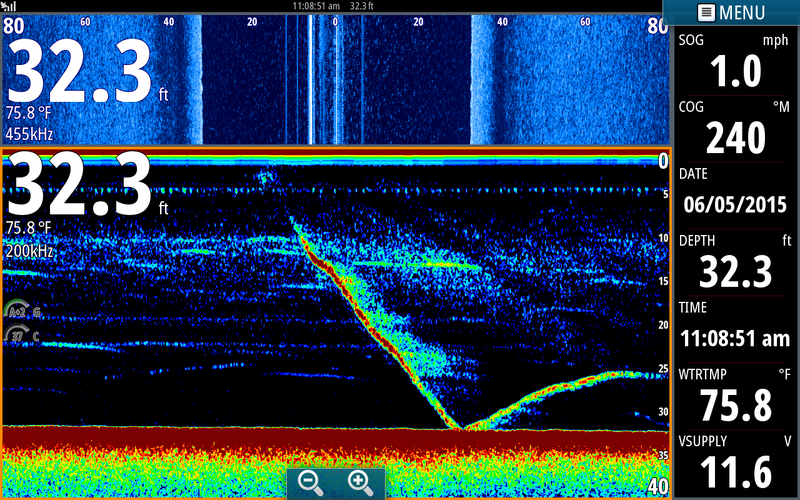 It shows much more detail and has more target separation especially at deeper depths. Depending on where I locate my rods in the boat I can monitor 6 to 8 baits at a time simply from watching my Simrad. Incredible technology! In this pic I have adjusted my upper limits to 15 feet. I do this when working fish that are deep. No need to look at unproductive sections of the water column. By making my range 15 to 40 feet I can see the fish so much clearer. In the near future I will show how by adjusting some of the features of your unit you can customize your screen to your specific fishing conditions.